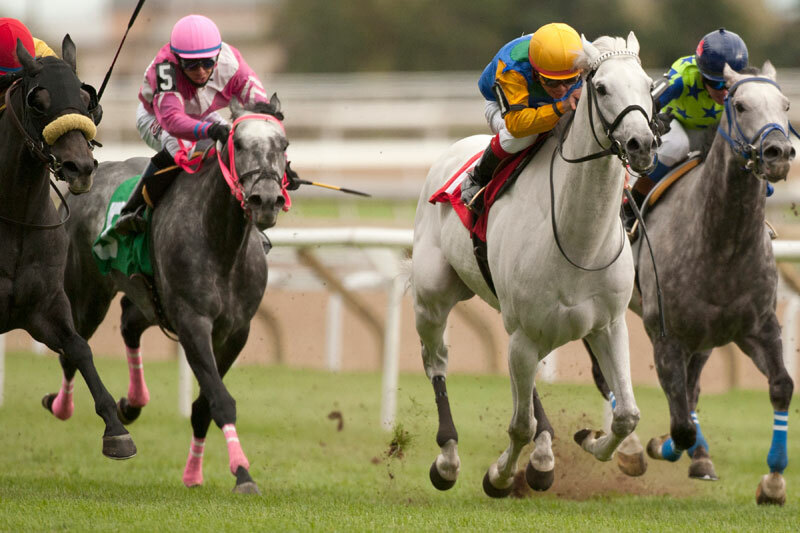 After finishing just a head shy of victory in last year’s inaugural running of the $50,000 Grey Handicap at Woodbine, the aptly-named Gray Phantom defeated a field of fellow gray and roan coloured horses to make his second appearance in the captivating Grey Day event a winning one. Aside from the unique colour conditions, the one-mile turf race was restricted to three-year-olds and up which have started for a claiming price of $20,000 or less in 2017-2018. With Kazushi Kimura aboard for trainer Jim Ensom, Gray Phantom stalked pacesetter Spanish Express along the rail through quarter panels of :24.53, :48.65 and 1:12.86 before making his move and splitting rivals as the field fanned across the track down the stretch. Gray Phantom struck the front late in the mile and held off the far outside closer, Macho Dancer, by a head in 1:36.81. Defending champion Arthur’s Pass finished less than a length back while nosing out Epilogue in a show photo. Owned by Augusto Onesi, Gray Phantom earned his first win of the 2018 campaign from seven races. Rebounding after clipping heels and losing his rider during his last start, the six-year-old Hard Spun gelding now has five wins lifetime and nearly $130,000 in earnings. Gray Phantom was the 6-1 third wagering choice and paid $14.20, $5.20 and $3.50. He combined with even-money favourite Macho Dancer ($2.80, $2.40) for a $2 exacta worth $36.70 while Arthur’s Pass ($3.20) completed the $2 trifecta, which returned $99.90. With 74-1 longshot Epilogue completing the superfecta, the payout was $1,029.70 for a $1 ticket. Spanish Express, Deesse Nike, Kapellmeister, Hines, Daylight Breeze and Crown Prince rounded out the order of finish.